The headaches have gotten worse. 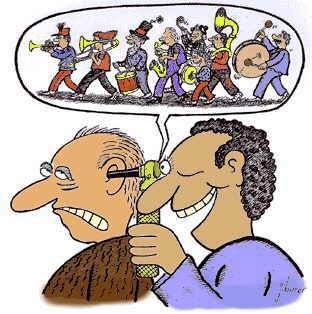 The tinnitus is mind-boggling. image from Google images, not sure where the original is from. Dr. Gray wants to test my pressure again. If it’s low I’ll be getting another myelogram to look for new leaks. If it’s high, I’ll probably be put on medication for a while, it may just be taking my body a while to get used to the higher pressure after patching the leaks. I’m so tired. And tired of just lying around. Staying horizontal is helpful, so that’s what I’ve been doing most of the time. Keeping a journal. I can now go in with dated material saying how I felt each day. This is thanks to the “morning pages” I’ve been writing for the Artist’s Way workshop. I write about much more, but of course, my health is in the forefront of my thoughts right now, so I’m writing a lot about that. Now I’m just going to go through my journal, and make a condensed diary of my symptoms. I should have been doing this all along, but I hate it. I don’t like to think about my symptoms on a daily basis. They seem worse when I actually sit down and think about it. I’m still trying to get my Day Zero list completed. I’ve completed 3 things, and have 10 in progress. Anyone else out there have a list of goals they are trying to complete? I’m finding this very motivating. I bought a Living Social offer for a local Art Class! And we bought one for Swing Dance Lessons! Yes the dance lessons will have to wait for a little while, but the offer doesn’t expire for 6 months. I’m confident we’ll be able to do it before then! I’ve been looking at the classes that are offered at Happymess (the place the offer is for), I’m hoping to learn how to Batik, or perhaps I’ll do a figure drawing class, or even a still life?? So much to do, so little time….just 978 days left, and 98 more things to complete. Wendy, I can’t even begin to understand how much you suffer with this disease. Just sounds horrible. I might try the 101 things list. If I do, then you can cross that off your list! I’ve been horizontal for quite some time now too. The other day The Joe-Man asked me if I have keeping track of how long long I have been in this flare. I looked at him with a blank stare. I, like you hate to write this stuff down…because when I read it, it just pisses me off. Hopr you feel good for the weekend. Thank you Mo, you are a dear. I had a friend visit recently, we used to be roommates in the mid ’90’s. She mentioned something about how long I’ve been fighting my health. That she remembered it from when we lived together. She was saying how great it was that I kept hope, and was so positive. But it was such a blow to think that is how people remember me…as being ill. And it was a blow to think that I’ve been fighting something for most of my life. I’m having fun doing the 101 things. I’m not feeling pressured because one of my goals is to donate $5 for every goal I don’t complete to a charity. So if I don’t get it all done, at least I’ll be contributing to a just cause. I think I’ll also say, if I complete them all, then I’ll contribute $101 to a favorite charity! I’m determined to get it all done! It’s been a long time since I’ve had goals. it feels good. I may change a couple of them, I was reading them over and think some sound too much like others…need to vary it up a bit. let me know if you start it. I’ll be so happy to cross that off my list…and to hear what you are doing! I hope that your health issues stabilize and improve! It must be tough trying to stay focussed and positive! It’s an indication of your strength of spirit that you are able to do so! Hope you get to take those swing dance classes soon! I’ve started a 101 list (thanks to your mentioning it), but I’m no where near completing the list, let alone cross something off, LOL. And, you are the second person today whose blog mentioned “morning pages” and the Artist Way. Seems like I should look into this, although I have no artistic talent! I recently found my copy of “Drawing from the Right Side of Your Brain” (from the 1970s or 80s); I determined back then that I couldn’t draw from EITHER side of my brain, LOL! Phylor, I have that book! I should pull it out. The Artist’s Way I’ve started a few times, this is the farthest I’ve ever gotten in it. I’m not sure if it’s going to help, it focuses on a divine spirit being the cause of your creativity. I’m not really into that. But I’m giving it a try. Yay, 101 list! I have a long way to go to finish mine too! Some things will take a long time to do, but it’s nice to have a goal to strive for. I hope Dr. Gray is able to give you a definitive answer as to what the cause is. When are you getting your pressure checked? Add me to the list of people who have been lying down a lot lately. This year, there seems to be extra changes in air pressure that are affecting us here. We are complaining of worse allergies and more aches and pains. My disequilibrium has evolved into mildish dizzy spells a number of times. Very strange year. I took a look at a couple of videos on YouTube to see some swing dancing and it looks like a lot of fun. I hope you guys enjoy it. How many classes do you take and, more importantly, will there be pictures? Maureen, Don’t know when I’ll get in for the pressure check yet, still waiting to hear when they can get me in. I’ve noticed more people have been complaining about allergies this year here too. And I’ve noticed on the blogs I’ve been following that a lot of people have been having a hard time lately. Dancing is a great idea! It’s a positive way to ‘show to everyone, especially yourself, that you’re not going to let this condition rule your life. Hell, I don’t even like dancing, but I go off to lessons with my wife on Monday nights because she likes it- but mostly because i get a kick out of doing something active despite the Meniere’s. About the only things that give me more satisfaction are acting in the local community theatre, and the times I went snorkelling on the Great Barrier Reef. Obviously, don’t be silly about it. Plan it carefully, have a back up plan, have some medication with you, and keep an eye out for the tell tale symptoms- but try it- it’s a massive confidence boost. And being positive is the best thing we’ve got going for us with this damn disease / syndrome / condition. I would encourage you to have a go. I also think getting right into the art is a great idea. When you get absorbed in the creative side, you get a break from all the fuss, worry, and anxiety that goes with the medical side of things and clogs up your brain. Having a break is a bit like a holiday- it helps build you up again and gives you energy for the next battle. I will take your advise to heart.